Jesus gave us commands that went beyond the Ten Commandments, some new and some from the Old Testament. What seven commandments did Jesus give us from the Gospels? Like the Ten Commandments, these commands that Jesus gave in the gospels were not the ten suggestions but imperative commands that we have no room to rationalize them away. If Jesus came down to earth, which He is destined to do again, and He came to you and told you to do something, surely you wouldn’t hesitate would you? You wouldn’t try to wiggle your way out of it would you? When Jesus gives believers commands, He is not asking us to do them but tells us to do them. He said that “If you love me, you will keep my commandments” (John 14:15) so our love for Christ is reflected in our obedience to Him. If you don’t love Him, naturally you won’t obey Him. Obedience tells us whether we truly love Jesus or not so in these seven commandments, we must prove our love for Him by keeping them and teaching others to do the same thing. 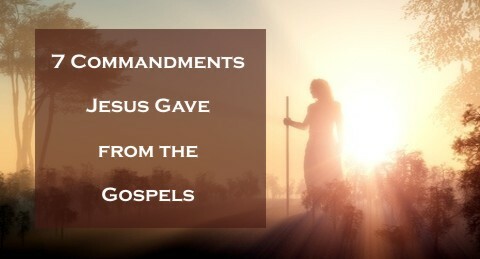 Truly, there are more than seven commandments that were given by Jesus as I counted over 30 so there may be more than that but I do hope to reveal seven of the greatest commandments Jesus gave us in the gospels. Here is “a new command” that Jesus gives to His disciples, and if we are saved then this means us. We are commanded to love one another but how great is this love to be? We are to love one another just as Jesus loved us. That’s a tall order! If we love one another like Christ loves us then this means that we will not gossip about others, we will be a servant of others, we will put others ahead of our own interests and if we do this, “everyone will know that [we] are [His] disciples.” This love is an evangelistic love that draws men, women, and children to Christ because they reason, “Look at how they love one another in such a sacrificial way…that is real godly love” and so even the lost will know that we are the disciples of Jesus Christ. It’s not about religion but about a relationship with the Son of God. This command is off the charts for those who don’t have the Holy Spirit. The Romans could not have understood this at all. Really? Pray for your enemies? This is diametrically opposed to the ways of the world and that is exactly the reason that Jesus commands us to not only pray for our enemies but to love them too! Is that humanly possible? No, it is not. This kind of love…loving our enemies and praying for those who persecute us is the kind of love that is like that of God and we can’t possibly do it without the Holy Spirit of God. He tells us to pray for them and love them “so that” or in order that we “may be sons (and daughters) of [our] Father.” A godly love is one where we are to pray for our enemies because Jesus prays for us and died for us while we were still His enemies and wicked sinners (Rom 5:8, 11). You might not think of this as being a new command but we see that it was “From that time [that] Jesus began to preach, saying, “Repent, for the kingdom of heaven is at hand.” From what time exactly did Matthew mean in his gospel? It was from the time that “Jesus began to preach” or began His earthly ministry. This is the only command that I could find that is directed to those who are not yet saved. Jesus says to “repent” in an imperative statement or as a direct command. He never gives the idea that this is an option. The kingdom being at hand means that if it is at hand, it is within reach or within an arm’s length so the kingdom’s being at hand is made so with the appearance of the King of that kingdom, and that is Jesus Christ. Once again this doesn’t seem, at first glance, to be a new command given by Jesus but He tells the disciples, and again by extension, He tells us, to “believe” in Him and that He is “in the Father and the Father” is in Him. Jesus uses the Old Testament name for God: “I am” so He is essentially commanding us to believe that Jesus is the “I AM” of the Old Testament, even though most people might not catch that. Jesus actually gave seven “I AM’s” in the four gospels. He also tells us to believe that He and the Father are in One Another. The Jews sought to stone Him for saying such things because He made Himself out to be God, which of course He is. Some cults do not believe this command, therefore they don’t believe in the true Jesus Christ. There are several other places where Jesus commands His disciples to believe in Him so this is no accident that to believe is a given command (John 14:11). Jesus tells his disciples, and He tells us to follow Him but if anyone is to follow after Jesus, they must deny themselves and then “take up His cross and follow” Him. Jesus uses hyperbole when He says that if we would save our life we must lose it and if we lose our life for His sake then we will find it. I believe He means we will find eternal life. The command is to take up His cross and then follow Him. This is not a suggestion. If we want to follow Him, it is conditional; we must take up His cross and deny ourselves. We must deny the things that we like, the things of this world, and take up the things that Jesus endured. This is a direct, imperative command like that of a parent who would command their children to get out of the middle of the street. There is no plan B. Jesus tells the disciples and He tells us that “you will be my witnesses in Jerusalem and in all Judea and Samaria, and to the end of the earth” (Acts 1:8). This commandment of the Great Commission is given three times. Twice in the gospels (Matthew and Mark) and once just before He ascended (Acts 1:8) so this is of particular importance to Christ. Any command or statement that Jesus ever gives more than once is always held to be of supreme importance and we are told to go and make disciples of all nations, to teach them what Jesus teaches us, and to go into all the world, even if its next door. for those who despitefully use us (Luke 6:28). When the disciples came to Jesus they didn’t ask Him “Lord, teach us to preach; teach us to heal; teach us to minister….but teach us how to pray (Luke 11:1) because they saw that Jesus was truly a Man of prayer. Jesus commands all who are not saved to repent (Matt 4:17), to take the gospel into all the world (Matt 28:18-20), to take up our cross and follow Him (Matt 16:24-25). He also commands us to believe that He is in the Father and the Father is in Him (John 14:11), to stay alert and always pray (Luke 21:36), to love one another like Christ loved them (John 13:34-35), and to pray for our enemies and those who persecute us (Matt 5:44-45). These are not suggestions but commands given by the King of kings and Lord of Lords, Jesus Christ our Savior. The only question is, you I obey? Will you? Interested in what you have to teach. Thank you Robin. I am so sorry. I was wrong. It was a typo and Matt 6:6 says to “pray to the Father in secret” not in the Father’s name but TO the Father. I apologize. That got by me and thank you for pointing that out. PS, I did correct it. I am grateful for pointing out my mistake and it was a big one. I am indebted to you. Please could you explain what it means to “not use vain repetitions” in prayer? Thank you HelenV. Vain repetitions are what Jesus said not to pray like (Matt 6:7). The word vain means “empty, useless, void of feelings or emotions” The word “repetitions” means doing the same thing over and over again so vain repetitions are using empty, useless, void emotions of repeating the same prayer or words over and over again like many do with what is called The Lord’s Prayer but Jesus say “Pray like this” not pray this prayer over and over again because that would be a vain repletion. In Matthew 6:5-8 Jesus said “And when you pray, you must not be like the hypocrites. For they love to stand and pray in the synagogues and at the street corners, that they may be seen by others. Truly, I say to you, they have received their reward. 6 But when you pray, go into your room and shut the door and pray to your Father who is in secret. And your Father who sees in secret will reward you. 7 “And when you pray, do not heap up empty phrases as the Gentiles do, for they think that they will be heard for their many words. 8 Do not be like the.” Does this make sense Helen? I pray it does and thank you for your very good question. Jesus said I came to fulfill the law. The ten Commandments reference the letter of the law. To obey Him is the proof of our llove. But obedience should not be an obligation but a desire from the heart that takes no thought. Free will has chosen obedience out of His love for US. we must KNOW that He loves US experiencially from previous acts of obedience. One we have had the intimacy of His abiding through “faith works” we realize it is His faith and not ours and it is His love and not ours that flows (Romans 5:5) the flow of His love becomes His multiplication by His manifestation in our mortal flesh. God is Love and God is all powerful and the power of Love is in this flow of His Spirit. Once the flow of Holy Spirit becomes our default expression we love unconditionally. Not of our self but from the excellency of the power of God by His indwelling treasure of Holy Spirit flowing in and out. Baptism of Holy Spirit gives us the unction for words obediently spoken and works of His faith works giving us “good news” testimonies of how God changes lives. Life of the world in exchange for life in KINGdom. The “NOW TESTAMENT” age we are in requires US to testify the now wotking of God’s Spirit of power to bring change today. The good news of 2,000 yeaqrs ago is for believers edification that must be verified with today experiences. Only the NOW FLOW fo Holy Spirit expression will draw ment unto Himslef. We are to be that expression. Obedience is about effort and hints of the law. There is a place we must come to as an “OVERCOMER” that requires no effort. They overcame by the blood of the Lamb and the word of their testimony. The blood has been shed sin has been attoned for, all that is left is to allow Abba to perfect US in every good work for the doing of His will doing in US that which is well pleasing in His sight through manifestation of JesUS in US be the glory for ever and ever. Heb 13:20,21. Perfection comes from ot trying but from experience of being HIS FLOW OF HOLY SPIRIT POURED IN AND OUT UNCONSCIOUSLY. We love Him because we have experienced His love for US in KNOWING HIM BY ABIDING AS ONE. Apostle John was not conscious of His love for JesUS He was attracted by JesUS’ love fro him. This “he loved US first” must be KNOWN by US experientialy before we will reciprocate unconditionally to be HIS manifestation to draw all men by that same love to HIMSELF through US. Others (unbelievers) will love US and be drawn to US because we loved them first, not with our love but His love. Requires flow from baptism of HOLY SPIRIT als else from man is deception of true love.